We met playing on Words with Friends. He is from Sweden, but came to America when he was 11 with his mother because his father passed away. His mother is now deceased as is his wife. Has a 16 year old daughter and lives in a fancy apartment in Boston. Claims to be a captain on a Maersk cargo ship. 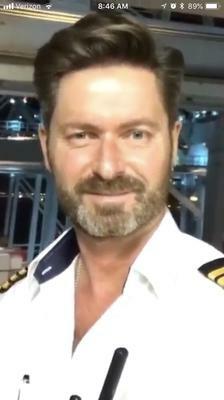 Sadly he has stolen the identity of a ship captain who is from Denmark, gay, and happily married to a man. This scammer is also on Tinder! Sorry ladies I threw away some notes I took when I recently got on POF 11-01-18 but this dude was recently on POF and I think he was using Jeffrey Thomas Johnson. He gave me a phone number right away. Next time I won't throw my notes away. It's a good idea to take notes of gents you meet like their user name etc. and that way you can report them with more info to alert others. Beware Engineers, Widowers, they have kids and speak 2nd language - there are so many on POF it's hilarious and they are baiting us with the prospect of them being rich so don't loose sight of your morals and remember if it's too good to be true its probably a FAKE PROFILE. I read where this gentleman's pictures and identity is being used in over 300 fake profiles.